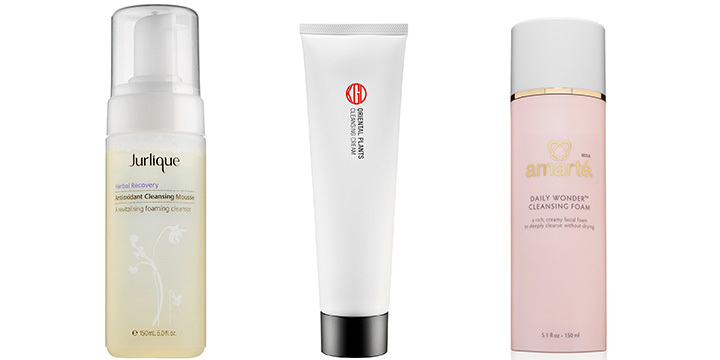 In Korea and Japan, women have long considered skin care the key to good makeup. Only a strict skin care regimen of layering products, patting into skin for proper absorption and facial massage can prep skin to “eat” your makeup well, with foundation melting into skin and imparting a natural finish, as opposed to sitting on top and looking like a mask. Throughout Asia, cleansing is widely considered the most important part of skin care, which has resulted in the development of highly specialized products and methodologies,” says Chang. “The double cleanse method is commonplace in Korea and Japan, where there is the belief that because multiple ‘layers’ are needed to achieve a finished daytime look (skin care, makeup, UV protection), more than one step of cleansing is needed to truly remove everything.” The first step is to remove makeup and sunscreen with a cleansing oil. “These products are formulated to remove even the most stubborn oil-based products and eye makeup,” says Chang. After an oil cleanser, the second step is to clean dirt, pollution residue and debris with a foaming or gel cleanser. From left: Jurlique Herbal Recovery Antioxidant Cleansing Mousse: A luxuriously foaming cleansing oil with jojoba and grape seed oils. Koh Gen Do Cleansing Cream: The velvety texture becomes slippery as the cream, enriched with 36 botanical extracts, is transformed into a oil. Amarte Daily Wonder Cleansing Foam: This whipped foam cleanses even oily and acne-prone skin without drying. From left: La Mer The Treatment Lotion. SK-II Facial Treatment Clear Lotion. Amorepacific Treatment Toner. This is where it can get confusing because essence and serum are both skin treatments with high concentrations of beneficial ingredients. In Asia, what is called “essence” can range from a liquid (some are even sprayed on) to a thicker serum-like texture. “Women in Korea use the two words interchangeably,” says Chang. “In fact, many foreign brands rename their serums locally as ‘essences,’ since this is the more widely understood term.” Generally, think of essences as lightweight versions of serum, both in texture and often in concentrations of active ingredients. So if you’re in your 20s, go with an essence. A little older? A serum might be better. Sulwhasoo Capsulized Ginseng Fortifying Serum: Encapsulized ginseng (in a cool UV coated bottle) fortifies skin’s elasticity. Shiseido Bio-Performance Glow Revival Serum: A serum that zooms in on the skin’s capillaries for optimum skin health. 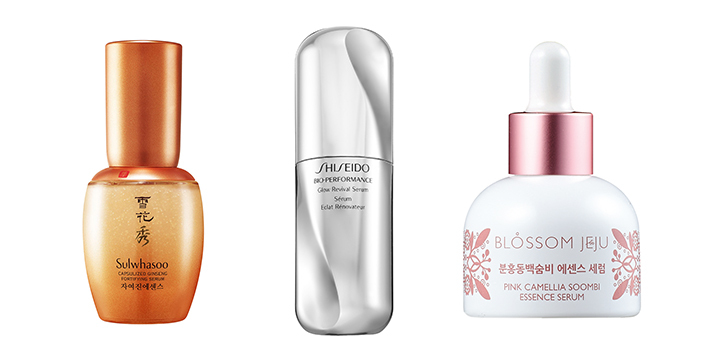 Blossom Jeju Pink Camellia Soombi Essence Serum: An antioxidant powerhouse from the lush Korean island of Jeju. Whatever you call it, this step is basically a lightweight moisturizer to replenish skin’s hydration levels. Emulsions provide light hydration on its own, says Burns-LaRiche, so in hot summer weather or if you have an exceptionally oily skin type, you may want to skip the face cream step. 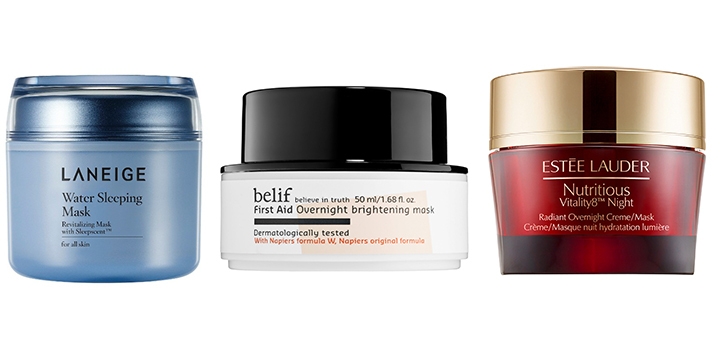 For drier or more mature skin, you’ll want to layer on both. 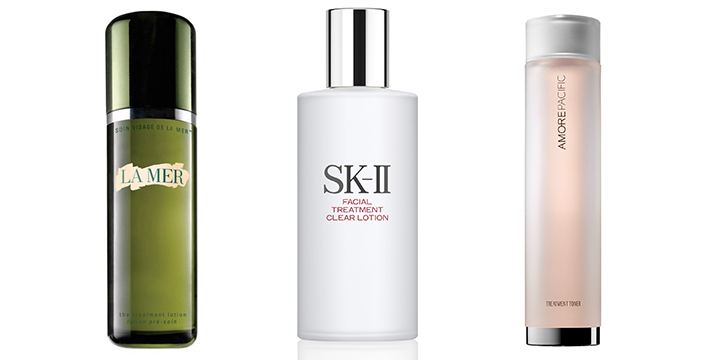 Korean skin care is a routine that begins very early on for preventative purposes,” says Burns-LaRiche. “This is not so common in Western culture. Young women in Korea use eye creams to keep fine lines, puffiness and dark circles away.” SK-II’s Essential Power Eye Cream is formulated based on studies that show that under-eye bags begin to sag in your 20s, eyelid wrinkles start forming in your 30s, and crow’s feet in your 40s. For deep hydration of the skin, use one with SPF for day and one formulated to take advantage of your body’s restorative processes at night. Overnight masks or “sleeping packs,” as they are referred to in Korean skin care, offer a deeper, more effective level of hydration and nourishment, more than a cream can, says Burns-LaRiche. From left: Laneige Water Sleeping Mask: Ionized mineral water and ceramides deliver intensive doses of moisture while you sleep. Belif First Aid Overnight Brightening Mask: From one of the best-selling brands in Korea comes this mask featuring black truffle and their signature brightening complex. Estée Lauder Nutritious Vitality8 Radiant Overnight Creme/Mask: A powerful pomegranate complex for intense moisture all night long. Adapted from the original story written by me and published in Audrey Magazine. Thank u 4 the essence clarification! Will you post on recommended eye creams?